I was excited to receive the KRAVE Jerky Holiday snacking kit last week. I have tried many jerky brands to only be disappointed with the texture or flavour. 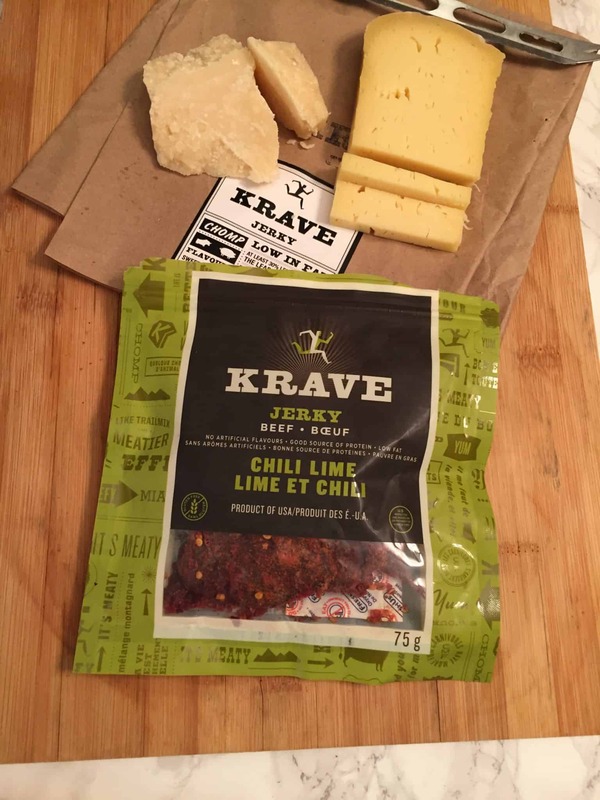 KRAVE Jerky has unique savoury flavours and is tender, not dry and chewy like some other brands. I love that KRAVE Jerky is gluten-free, low-calorie and is natural. It is difficult to find a handy protein snack that you can throw in your bag and snack on throughout the day. 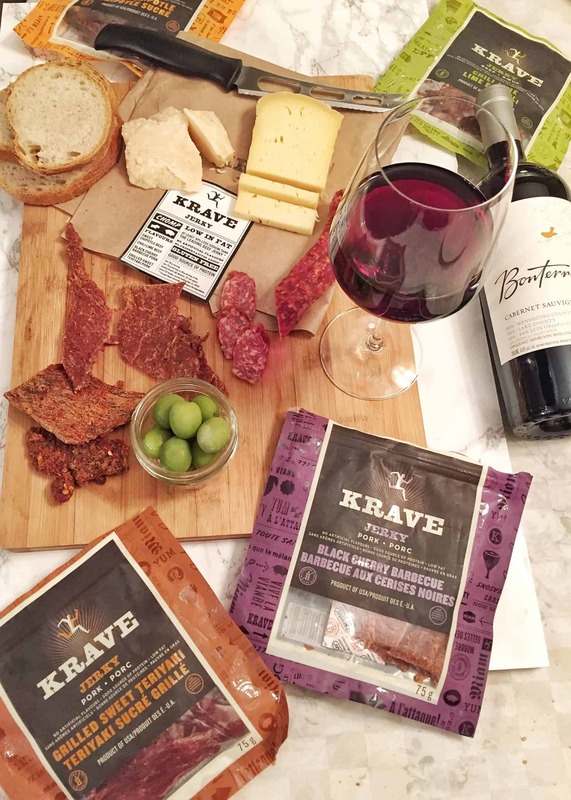 We decided to enjoy the KRAVE Jerky with some cheese and vino – cheers! 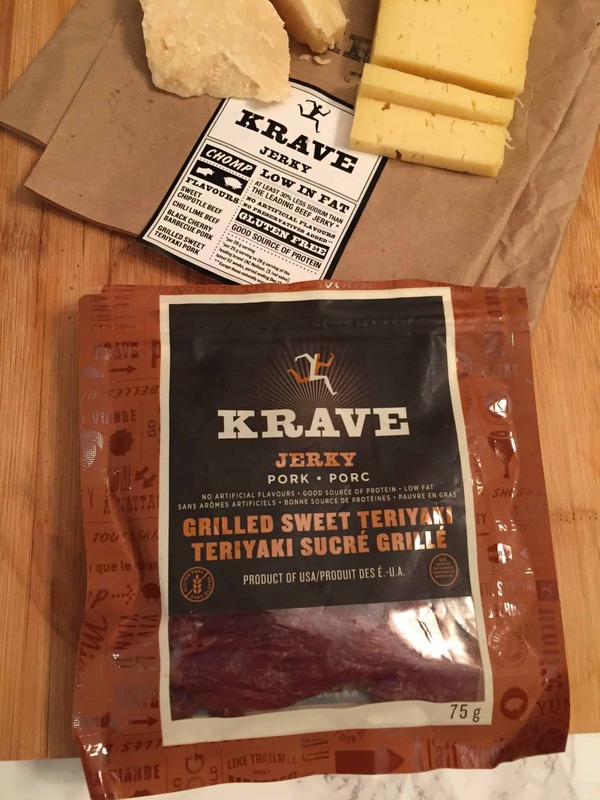 KRAVE takes jerky to another level! They elevate it to all-natural – with no artificial ingredients and minimal processing – and whole-muscle cut MEAT. After bathing in the marinade for 48 hours it’s off to BAKE, resulting in a moist & tender jerky experience unlike any other. KRAVE is entirely gluten-free and devoid of nitrites, MSG, and corn syrup except those which naturally occur in sea salt and celery seeds. A good source of protein, KRAVE Jerky is a great anytime snack. 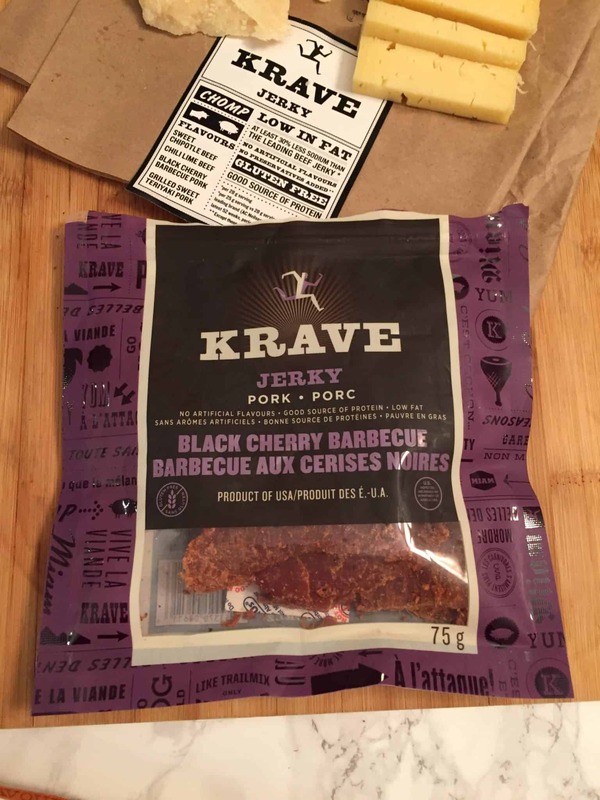 With no added nitrites* and artificial flavours, all-natural** KRAVE Jerky has an elevated conscious, using lean cuts of meat and all-natural, gourmet ingredients. Here are the flavours I got to test out – I loved them all! As KRAVE’s newest jerky flavour, our black cherry barbecue pork offers up a finger-licking good taste from the heart of the wine country! We infuse tender slices of pork with our sweet and peppery, Sonoma-style, black cherry barbecue sauce. The result is a delicious jerky that will leave you KRAVE-ing more! Tease your taste buds with tender slices of knuckle-cut domestic beef teamed with medium-hot chili and finally balanced with zesty lime. This marvelously moist jerky is easy to tear and share, and its unique profile provides a dose of medium heat that partners well with the acidity of the citrus. We know you will enjoy this Chili Lime Beef Jerky. Made from authentic Mexican chipotle, this jerky brings together natural smokiness, a sensation of moderate heat, and a hint of honey to create the perfect balance of sweet and smoky. Tender slices of domestic beef are double marinated and then baked, resulting in an extraordinarily moist, soft and jerky. Olé! Tender pork slices are soaked in a smoky teriyaki soy marinade, creating a moist and flavorful jerky with a touch of sweetness complementing the natural savory profile of pork without the excess salt. All of these have so much flavour. They are very moist and not chewy like some other brands. I’m hoping to try the other flavours as well. These are great for holiday snacking but also wonderful for throwing in your purse for on the go. 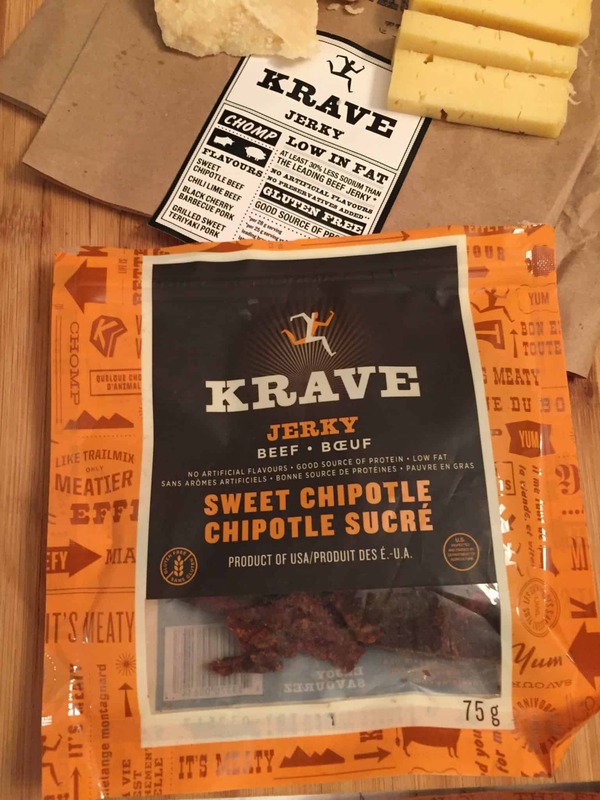 Have you tried KRAVE Jerky? What is your favorite flavour? I’ve tried this in the turkey… but I don’t remember the flavour. It was tasty!